Exclusive CaterCooler is perfect for maintaining cold foods for off-site feeding and outdoor events. 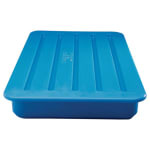 Freeze CaterCooler overnight or for eight-hours and it will keep foods cold for up to eight hours without ice. * Designed to slide into a Cateraide End Loader (PC300N), Double End Loader (PC600N) or place on top of the food pans in a Top Loader (PC180N). With and overnight charge in your freezer, Coldmaster keeps food at or below the SERVSAFE guidelines of 40 degree F for the entire length of its cold-retention period. "This product works great and keeps stuff at temperature for most of the day. Only improvement I can see is a design that is more easily cleanabl..."
"This product works great and keeps stuff at temperature for most of the day. Only improvement I can see is a design that is more easily cleanable (i.e. fewer crevices). I have many of these items."